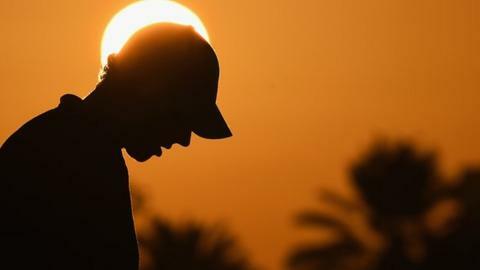 After the fun of the first month of the golfing year now it turns "nasty" for the world's top golfer. That was the word Rory McIlroy chose to describe the process he is about to enter in Dublin's High Court. The legal action comes in the wake of his convincing triumph in the Dubai Desert Classic and a runner-up finish in Abu Dhabi earlier in January. Now his battles are not with leading stars from the European Tour or the best golf courses in the Middle East. Instead it is his dispute with Horizon Sports Management, and there are millions of Euro at stake. It seems extraordinary the case has reached this stage. There seems so much to be lost and very little to be gained when the legal and financial affairs of such a high profile sportsman are unveiled in such a public forum. However, the two sides in this bitter dispute appear unwilling to budge and as McIlroy told the BBC last week, that's why it has to be put into the hands of a judge. In October 2011 McIlroy surprised golf insiders by moving from Chubby Chandler's ISM stable, which had nurtured him through his transition to professional golf. Only four months earlier the young star had lifted his first major with a stunning victory at the US Open. McIlroy, however, opted to join Horizon, a small boutique agency based in Dublin run by Conor Ridge and Colin Morrissey. McIlroy was joining the same organisation that ran the affairs of his big friend and Ryder Cup team-mate Graeme McDowell. The following year McIlroy went to world number one, won his second major at the PGA Championship and Horizon hammered out his contract with Nike worth $20m (£13.3m) a year over five years. Despite the negotiation of $129m (£86m) worth of deals, and a more favourable restructuring of his Horizon agreement, the relationship turned sour in the spring of 2013 and McIlroy wanted out. His lawyers claimed he had been taken advantage of by signing his original Horizon contract at a Christmas party in surroundings of "great informality". But the heart of McIlroy's complaints relate to fees and commissions which his legal team have stated "were so unfavourable towards the plaintiff [McIlroy] as to amount to an unconscionable bargain". Horizon vehemently deny this and point to the contracts they negotiated on the golfer's behalf with Nike, Omega, Bose and Santander, which they say would net their former client a minimum of $129m. Under the terms of the original contract between the player and his agents, Horizon were entitled to 5% of McIlroy's on-course earnings and 20% from endorsements they brought in. This was renegotiated in the spring of 2013 with Horizon taking nothing from his prize money and a smaller percentage from deals. But soon afterwards, McIlroy announced he was leaving Horizon to set up his own management company. Then in September 2013, at the time of McDowell's wedding in the Bahamas from which he was noticeably absent, the world number one announced he would be suing to nullify his Horizon contract. The Dublin-based company retaliated by countersuing for breach of contract and unpaid fees of $6.8m (£4.5m). Ever since, the case has been trundling through the Irish legal system. A judge imposed a period of forced mediation to try to find a settlement without the need for a trial but that failed. So too did Horizon's bid to have eight of McIlroy's smartphones forensically inspected after they were wiped clean of data. Now the case is set to go to full trial. It could last six weeks, although the player will not have to be there for the full period. Who knows what financial revelations might fall into the public domain? McIlroy is expected to be in the Dublin courtroom for Tuesday's opening sessions. He is likely to give evidence, spending several days in the witness box. He is looking forward to the process being over by the time he heads to the Masters in April, but although he could do without the case there's been little sign of him backing down. Equally, Horizon appear determined to have their day in court. Conor Ridge has claimed the McIlroy side have sought to inflict "maximum reputational damage through the media". And for the Horizon boss this is about more than the money, he wants his side of the story heard as he seeks to protect his reputation as a sports manager. McIlroy used the word "nasty" when discussing the case in Dubai last week. That apart he has said little, other than that the process is no distraction to his golf. His results on the course are testament to that, but now it is time for testimony of a different kind.